I've been in a semi-fog since last Friday. I had to do a errand, was hungry and needed to check my mail. Three little tasks, and I only needed to leave the car once. The car interior was warm when I got inside and it felt so good. It seems like I've been cold for ages. Even my blood temperature is low, so just sitting inside felt like a rare treat. The first task was easy, then I drove to get a burger and even that was easy. I pulled into the parking lot after my purchase, enjoyed the meal and the warmth of the day had me putting my head back and just resting. About thirty minutes later my hubby called. "Where are you?" "At McDonald's parking lot." "What are you doing there?" "I got a burger and now I'm resting. I have to stop at the post office and then I'll come home." He was okay with that answer. Driving to the post office, I felt really tired. So, I parked outside the door closest to my post office box and rested my head back against the headrest. I just didn't have the energy to go inside. I sat there awhile, a long while, then finally went inside and emptied my box. I dumped the mail on the passenger's seat and leaned back in the car seat. I was exhausted. I rested my head again, and instead of feeling the warmth inside the car, I started to shiver. I was cold and my body started to shiver. Finally feeling that I needed to get home as soon as possible, I drove slowly home. Once home, I threw myself in bed and started to shiver like there was no tomorrow. It took a long while to finally stop. So, since Friday, I've felt 'out of it' and hung close to bed. I don't know what the shivering was all about, but I've had it happen to me at a RWA Conference one year. Today, I 'feel' great. I still get tired easily, need to rest often, but it's as if the cobwebs have been banished from my brain. And I'm not cold. So, I figure it's like this. There will be days of clairty, days of dullness and days in between. What I need to do is not let the dark days get me down. Because if I let them grab hold of me, I might not see the sunshine days for what they are. Yesterday's title would have worked great for today, but my brain was apparently 'in between' and I didn't recognize it. What is that title about? I'm not quite sure. It just came to me, so I used it. I finally decided to 'come out' about my cancer through my signature line. I've told a few groups and online friends, but didn't come all out until today. This cancer thing is scary. I wasn't scared before, then the words 50/50 came out at the last oncologist appointment, and it took several days to settle in. And ONE out of EIGHT women will develop breast cancer. So, if you don't have it now, you might in the future. Here's some good advice, get your breast exam current, and go back in a year and do it again and each year after that. I was suprised at this second surgery. The first one, which I 'thought' was going to be a needle biopsy, was instead a full removal of the cancer, wasn't even painful enough for me to fill out the prescription. My surgeon raised his eyebrows when I told him I threw that prescription away. Sure wish I would have filled it and kept them for later. This second surgery, going in and redoing the first site to make sure and with the node removal, has given me great empathy for those people who are stabbed. (I know that this will happen in one of my books in the future.) I still have pain and need to work that arm to regain function. While in the reception area of the cancer center, my daughter handed me a catalogue, and apparently, if you have your nodes removed, say on your right arm, you shouldn't have your blood/pressure or any needles on that arm. And I just gave a big blood sample out of, you guessed it, my right arm. Which comes down to this, if one in eight women develop breast cancer, maybe, just maybe, you can gather some knowledge about the disease from this blog. You are one out of eight. Last year at the RWA Nationals, in the goody room, one author had these as giveaways. There was a little cover of her book hanging from the pin. I picked one up as I thought it was a nice gesture. I had two, then one drainage bags for the past ten days. When I got home from the hospital, I used this pin to hang the bags on my pants waistband. It was the only safety pin I could find in the house. How appropriate. I can't remember the name of the author, and really would like to thank her, for several reasons. Why did she use this as a giveaway? Was her book about a cancer survivor or did it have to do with her? Whatever her reasons, it came to use. It reminded me each time I touched the pin, that I wasn't alone. Someone out there, a stranger to me, gave me comfort. This cancer thing is so new to me. I have strangers praying for me, online friends reaching out to comfort me. Just knowing that there are people out there willing to share online hugs and prayers brings tears to my eyes. When you're most scared, you can rely on an invisible hug or pat on the back for getting through another day in a positive mood. See a cardiologist, I have one of those. See a nephrologist, I have one of those as well. Get a port installed in my chest. Wouldn't it be funny later on to get a little pink ribbon tattooed there. I might consider that for later on. Results of the PET scan determines what course of chemotherapy I will need. The radiation also depends on those results. A nurse is responsible for making all my appointments, and from what I heard from my surgeon, I'm booked for next Thursday and Friday. My hubby is feeling great that there is a plan in action. I'm still feeling sore, and have great empathy for anyone who gets stabbed in the chest. That sucker still hurts. So, the cancer itself doesn't give you any pain, it's the treatment! As for the lovely cancer pin, they are available from Oriental Trading. Again, many thanks to the author. I couldn't find a neat clipping or drawing for today's post. I woke up past my wake-up time and was close to an hour late draining my drainage bags. These two dangling darlings are not fun. Today was an office visit at the surgeons, so I had to shower, dry the hair, dry off the dangling darlings and put on a blouse. Why can't we wear our pajamas to the doctor's office? The dear hubby drove me the block to the office, and he waited in the lobby while I went into the examing room, where I immediately put my head back and fell asleep. My doctor interrupted the beginning of my dream, and I should have stayed asleep. He showed me my test results. I officially have 9 of 20 axillary lymph nodes positive for metastatic carcinoma. He said the results were 'bizarre,' and that's not a word you want to hear from your surgeon. Then he asked me why I was draining my bags every day at the same time??? Both his nurse and I rolled our eyes. Then he caught on that I was told to do it when I was discharged from the hospital. I have an appointment with the oncologist on Thursday to determine what is going to happen next. My dear hubby and son at home are treating me awfully nice. That's what worries me the most. My chant 'I can do this. I can do this. I can do this.' is hard to do today. I imagine that I will have more of these days in my future. An online friend stated today that I had 'tremendous grace'...I hope I don't let her down. I was in Tuesday Morning a week ago and noticed the cutie in Pink. All the Breast Cancer Awareness stuff is in pink, so I thought, why not? 'Dottie,' so-named by her manufacturer, sings and dances. 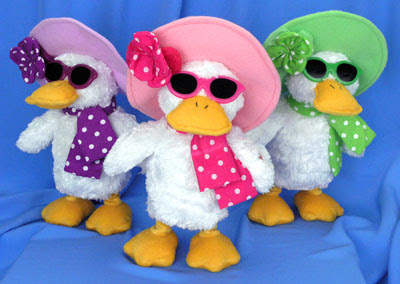 "Walking on Sunshine" in a little ducky voice. "I feel the love, I feel the love, I feel the love..."
Something quirky that brings a smile to my lips, and those of my littlest grandson. I felt that if I get depressed it should perk me up. So far, I haven't been depressed. If I get a little anxious, I just start muttering, "I can do this," over and over until I believe I can do this. At least it's working. The latest step in my battle was another slice and dice at the local hospital. My surgeon went in and did a lumpectomy and node removal. I spent the night, and slept pretty good, tho, it might have been the morphine! I whined like a wimpy girl. Now I have my cell phone on 'alarm' so I won't forget again. I'm a fast learner. Went the next day to the surgeon, changed the dressings, checked the two drainage bags and was asked to report back in on Monday. He works just a block away, so it's more than convenient. He called, yes, you read it correctly, he called to let me know that he hadn't received the report from the node removal. I thought it was sweet of him to do that. So, I'm waiting. 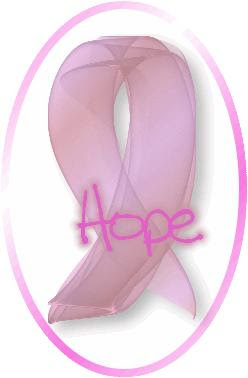 Next Thursday is the visit with the oncologist to determine if I will need chemo or not. The radiation is a sure thing, but the chemo is a maybe at this point. I want to thank all the friends who have reached out to me at this point in my life. Yes, I have breast cancer. I did the breast exam in October, 'Breast Cancer Awareness Month', and with further testing it was determinded that I did have cancer. I decided that I would come public with it, as the stats say that one in eight women will develop breast cancer. Maybe my journey will help another cancer victim deal with this strange new process. Well, did I mention before that the dh wanted to go with me to the doctor's? I'm sure I did somewhere. We've been married for over 46 years, and he has NEVER gone with me for a doctor's appointment. Well, we're sitting in the lobby and I'm filling out pages and pages of paperwork when my name is called. I get up, he remains sitting. "Hey big boy, let's go". He reluctantly gets up and goes into the examination room with me. This is a problem that we always have. He says one thing, then later denies it. "You said you wanted to go to the doctor's with me." "I meant drive you." "Why would I need you to drive me." "You asked me to come." "No. You said you wanted to come." "I didn't mean in the examining room." "What did you mean?" "Well, when you talk to the doctor, you know, in the office." The doctor comes in, examines me, I redress, and then she comes in again and I'm told exactly what stage of cancer I am in. That it was removed during the biopsy. But I would need to have my lymph nodes on that side removed. Then once there were examined, it would be determined if I needed chemo, at which point I would need a port. But not to have a port installed during the node surgery, as I might not need it. But I would need radiation to kill any remaining cancer in the breast as it's hard to get everything out during the previous extraction. Pretty much cut and dry. Do this, then we do that, if this happens, then we do something else. So...as we leave the hospital, I ask him if he was satisfied with the visit. "Yes, but I didn't need to come, you wanted me too." Later, he did say that he was feeling positive about the whole process. Ah, he was worried. Which is no wonder that the side of my head is flat from beating it against the wall. So, I moved up my appointment with my surgeon to Friday, to schedule the node removal. We seldom have 'snow days' in the south. But rainy days? We have a lot of those. I should be cleaning up the abode. Or reading. There's nothing quite relaxing like reading when the rain hits the metal roof hard enough to make sound. We've had a lot of rain lately, several days in a row, and I didn't do a durn thing. Which is relaxing as well. You know that you are protected in your cocoon. Pajama days are wonderful. Though scary if someone knocks on the door. I know, the first thing you are supposed to do is get up, get dressed for the day, etc., but some days are more enjoyab le if you don't have to get dressed. I also have the stacks of magazines, which I'm thinking of moving into the bathroom instead of leaving in the hallway. I've given up on tearing out articles, I find that I never use them. If I want a special recipe I generally go to FoodNetworkTV and get one of those. Of course, I have a lot of those that I have never prepared. But the ones I have, were wonderful. The closet needs to be cleaned out, but I'm saving that task until the end of February as the grandgirls are having a huge garage sale to help finance their trip to Europe during their senior year. Of course, if I started now, and did the whole house instead of just my closet it might be beneficial to all three of us. It's supposed to rain tomorrow. I need to get busy and start culling my stuff. January: Finish Young Adult story. February: Work on the New Orleans story. March: NOLA conference in Shreveport. Finish the New Orleans Story. April: Script Frenzy - Finish script started in 07. May: Finish that naughty story. June: Start writing on LI, be ready to pitch at Nationals. September: Work on the time-travel. November: NaNoWriMo for the month. December: Enjoy the season, but write daily. Send out queries to material that is finished and ready to go. Enter at least four screenwriting contests. Enter at least four romance contests. Study the craft daily. Keep the book in the throne room. Be serious about losing weight. Exercise daily at least twenty minutes. Do more in the garden. Take a picture every day as an exercise. Write down why I took the picture and print it out on presentation paper and bind in a book at year's end.